Welcome reader! 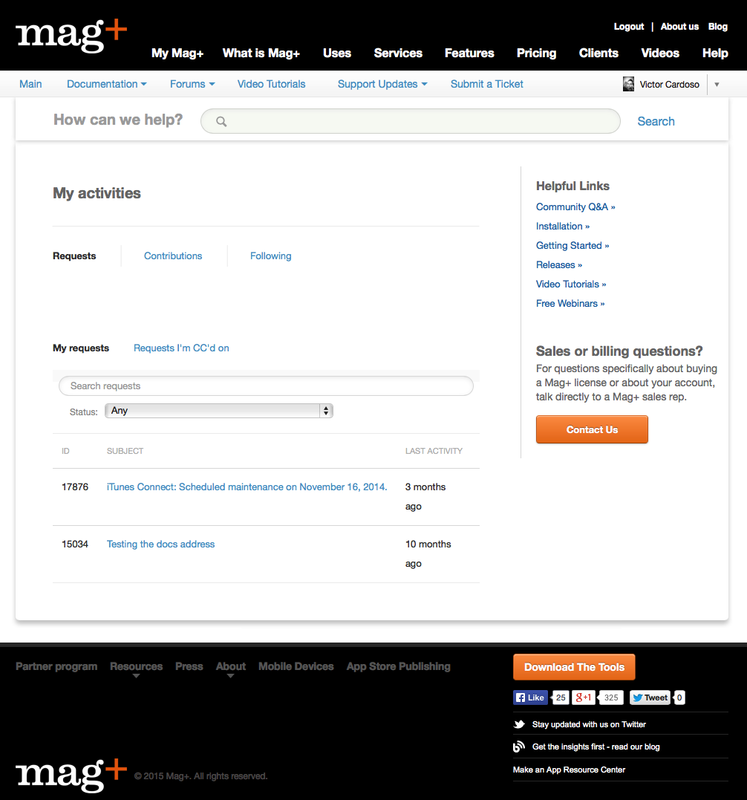 This is an introduction to a major redesign of Mag+'s Support Site/Knowledge Base. As you may have noticed over the past 12 months, we've been making incremental changes to the way we deliver information to you. We've reorganized topics, set-up some new standards for how articles are written, and have been going through all articles in the knowledge base to update them and make them easier to follow (this part is still a work-in-progress as there are many articles for us to rewrite, review, and publish). Support Site Redesign - An Introduction: That's what you're reading currently. This article summarizes some of the major changes you see when accessing support.magplus.com. Support Site Redesign - Section/Topic Changes: This describes the changes you see when accessing a major section or a topic within the section. Click on this link to read about the section/topic changes. Support Site Redesign - Article Changes: This describes the changes you see when reading a support article. Click on this link to read about article changes. So go ahead and read below to see the new major changes. Then, when you're ready, you can move on to the next two articles in the series. If you have any comments or suggestions to improve upon the changes we've made, please send an email to docs@magplus.com. 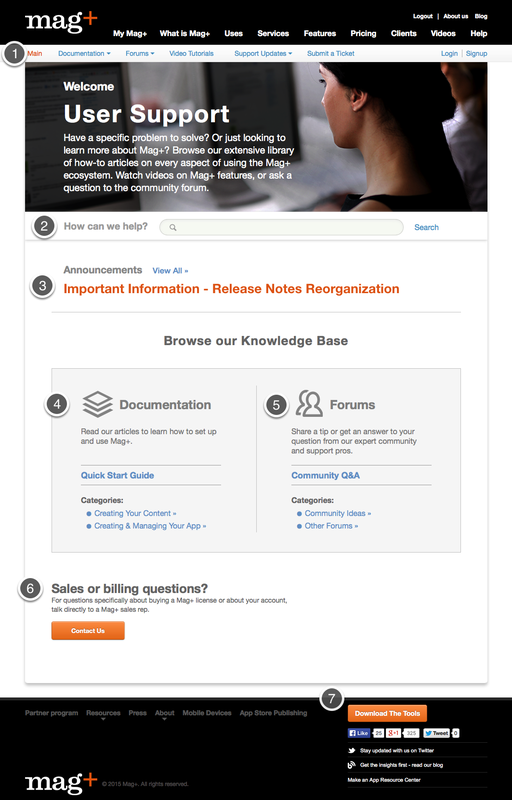 The new support landing page provides a more organized approach to accessing information about Mag+'s software, community forums, and announcements. Read more below for information on the new areas. Navigation Bar (Label 1): A new bar menu gives you quick access to Documentation links, Forum links, news on support updates, the ability to submit a support ticket, and the ability to login/sign-up for deeper access to the support site. This nav bar will follow you through all subpages in the support site. Search Field (Label 2): A new search field lets you perform searches from all the subpages in the support section: from section lists, article lists, and within an article itself. Announcements Section (Label 3): A new announcements section features a carousel that will show you the titles of important Mag+ announcements. You can click on the title to read the full article, or you can click on the "View All" link to see all the announcements Mag+ has published. Documentation Section (Label 4): The new documentation section highlights the major areas of interest for users of Mag+. There's a link to a Quick Start Guide and to the sections on Creating Your Content and Creating and Managing Your App. You can, however, always use the Documentation link in the nav bar (Label 1) to quickly access all the documentation topics and subsections. Forums Section (Label 5): The new forums section highlights the areas where you can interact with other Mag+ users and submit your ideas for product improvements. Sales/Billing Contact (Label 6): A new section highlights how you can contact Mag+ about any sales or billing questions. Footer Links (Label 7): A button in the footer allows you to download the Mag+ Tools. While all the information in our knowledge base is freely available to the public, logging in to the support site will give you access to an activities area where you can keep track of submissions, forum contributions, etc. It will also automatically fill out your contact information if you post in our forums. 1. Click on the "Login" link in the nav bar. 2. After verification of your credentials, you will see a personalized welcome screen along with a new option in the nav bar. 3. Clicking on the downward arrow next to your login will provide additional options, such as accessing your Activities screen. 4. "My Activities" will show you information such as your submitted requests, forum posts, and those articles/topics you are following.